A sport called Floorball is growing in popularity not only in the U.S. but throughout the world. While it may be new to many people, the core aspects are similar to those of many other sports, adding in elements of basketball, soccer, hockey, and lacrosse. What’s more, the fast-paced sport is suited for players of all ages and abilities. On the surface, most would say that Floorball looks like floor hockey, which is already in many school and recreation organizations. However, there are some key differences. The rules promote safety among players, with minimal body contact allowed. Players may not body check or attack an opponent by stick checking or stick lifting. They are not allowed to go through their opponent’s stick to dispossess the ball. Players may not raise their stick above the waist, and may not touch the ball with the stick above the knees. These rules help reduce potential injuries. Floorball sticks are made of carbon and/or fiberglass, and won’t damage wood or synthetic surfaces. The ball is designed to be controlled and easily directed, unlike in floor hockey, which uses a puck that jumps all over the place, or street hockey, which uses a ball that can damage facility walls. 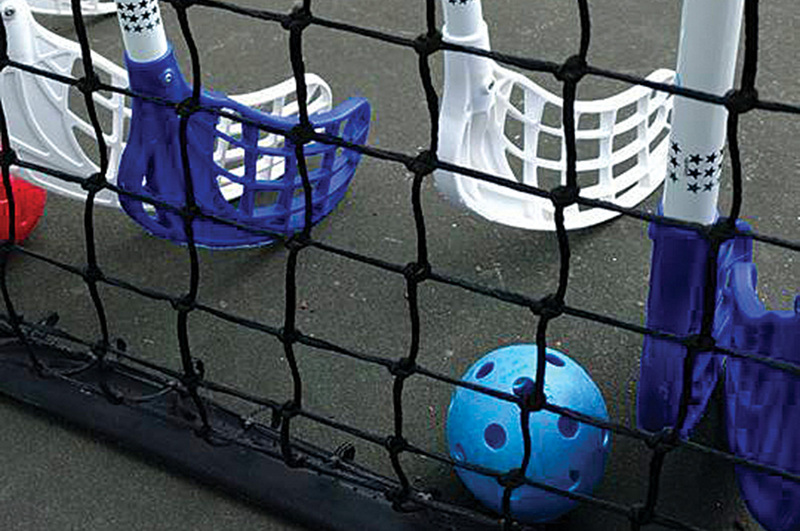 Floorball players may wear protective eye guards, but unlike floor hockey, protective equipment is not required. In fact, the cost to get started is minimal. An entry-level stick can be purchased for $30 to $50. Add in a ball and goals, and you’re all set. Adapting what you have on hand can minimize the cost. For example, pop-up goals will suffice to get started. In many cases, equipment can be purchased at group rates. Depending on the brand, sticks come in different sizes since Floorball sticks are sized to a player’s belly. Blades also can be set straight or curved for left- or right-handed players. A rough starting point when purchasing equipment is to consider a 60/40 split on right- and left-handed sticks. Simply getting sticks, balls, and goalie equipment is not enough, however, to begin a successful program. As with anything, the more expertise you have, the better result you will achieve. Like any newer sport, opportunities to play can be somewhat limited. Whether you’re looking to start a weekly pick-up game, instructional program, or a full-fledged league, the biggest challenge will be finding space to play. The beauty of Floorball is that it can be played almost anywhere, and can be adapted to suit your needs and facility restrictions. While the sport is usually played in a rink, it’s not required. If weather permits, go outside and find a community basketball court or tennis court. Once you have established a consistent space, use contacts and social media to create a club. The goal is to get people playing; the more interest for a club or group, the easier it will be to determine if a league should be established. Initially, you’ll spend a large amount of time educating friends, family, coworkers, and anyone who’ll listen about the sport. My experience has been to focus on small gatherings to help teach the rules and game play, and to ensure a fun experience. For the most part, I have focused on the informal process to convince people to give the sport a try. However, in many cases, sometimes there just has to be an opportunity to play. If you put most kids and adults on a court, they’ll figure out what to do with a stick and a ball. Once people get the hang of the rules and how to play, the level of play will increase accordingly. While there is curriculum information available, a class should be focused on teaching basic skills (passing, dribbling, etc.) and rules. The main age group for programming and classes will be around 7- to 15-year-olds, but there’s a strong market for 18- to 40-year-olds as well. Don’t try to make classes or programs gender-specific, but inclusive. As a recognized Special Olympic and Unified Sport, Floorball can also be played by manual and electric wheelchairs, which makes it a universal sport, regardless of age or ability. However you decide to start or grow a group, don’t be discouraged. It will likely take some time to get people connected and aware of the sport. Consider running youth classes as a way to grow the sport in your region. The important thing is ensuring an inclusive and fun environment for all to partake. Now get out there and start playing. David Crawford is the Director of Recreation Services at Saint Martin's University in Lacey, Wash. He instructed Floorball programs with city of Lacey Parks and Recreation, Saint Martin's University, Special Olympics of Washington, and Gretzky Hockey School. He also previously played for the USA Men’s National Floorball team. Reach him at david@floorballguru.com.